Volkswagen Polo will get a mid-life updates this year after made its debut in 2009. 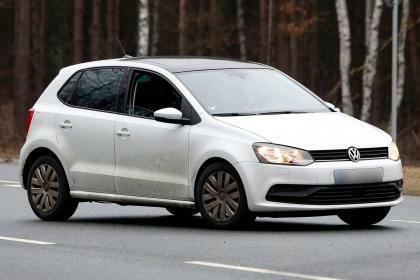 The prove is on the road where VW’s engineer is caught testing a latest Polo undisguised! Changes are including sharper bumpers, a new grilled with three chromed lines, new taillights with Golf style. Auto Express reported that facelifted Polo will have adjustable dampers and adaptive cruise control for the first time. And according to Auto Express’ photo, the interior to be equipped with a new stereo, steering wheel, and climate controls. For the engine, latest Polo is reported to have 1.2L and 1.6L TDI diesel engines. For petrol, the old 1.2L could be replaced with 1.0L 3-cylinder from VW Up! 2015 Volkswagen Polo is expected to be introduced at 2014 Geneva Motor Show 2014 and will go on sale later this year.